In the early 1980’s a constitution was painstakingly prepared by a small group of Chellaston residents with the aim of creating an Association with the long term aim of building a Community centre for the residents of Chellaston. Discussions were held with Derby City Council who agreed to match our funding pound for pound when we achieved £20k. The “village” as it could be described then was involved in significant fundraising events; our community centre at that time was using the senior school, local pubs or one of Crocker’s marquees. In 1987 we hit our target and so surprised were the City Council that they doubled their contribution in the form of a grant to £40k. The CCA along with Architects designed the original section of the building and it was built at a cost of £85k. This required the CCA obtaining a £25k interest free 7 year repayment loan with the Council and the leasing of land to the CCA by the City Council at a peppercorn rent. In 1988 the building was opened and used regularly for CCA fundraising events as well as a wide range of user group activities. In 2001 an extension was built with £91k of Section 106 monies provided by the housing developers of East & West Chellaston and a further £36k in 2011/2012 for further improvements/repairs. 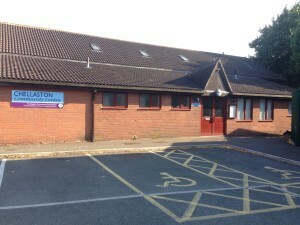 Chellaston Community Association is a registered Charity and the elected committee members are trustees of the Association and the Management Committee of the Centre. All residents of Chellaston, over 18 years are members of the Association. The Constitution details how the Association operates and it is the responsibility of the Trustees (Committee) to ensure that this happens. It is stipulated that the Annual General Meeting should take place every October. The meeting receives a Chairman’s address and a Treasurer’s report on the financial status of the Association together with the election of new Trustees. The Committee comprises of 3 officers, President, Secretary and Treasurer and Committee members, one of these being elected as Chairman at the first Committee meeting. The Committee normally meets once a month at the Community Centre. In 2017 Chellaston Community Association became a Charitable Incorporated Organisation (CIO) and all information relative to our operation as a CIO is shown on the doocuments page. The Trustees have embarked on a programme of modernising the building and to date have spent over £100k on the refurbishment of the main kitchen, lobby toilets and improvements to daylight within the hall and adjacent rooms. The longer term aim is to provide a multi-purpose activity suite with the building of an extension to the west side of the premises to meet a continuing demand for community facilities.